Up to your mid-20s your skin will keep itself hydrated and youthful looking through this constant process of repair and replenishment. But as you start to get older your skin’s processes don’t work as effectively, which is when your skin begins to show visible signs of ageing. Why does your skin show signs of ageing? • Your skin produces less elastin and collagen which keep your skin smooth and firm. • The natural process of skin cell renewal begins to slow down, meaning that fewer new cells are produced and the older, dead cells are not shed as frequently. • Your skin’s natural defences become less effective, allowing free radicals or reactive oxygen species (ROS) to damage healthy cells and protein in your skin, such as collagen and elastin. 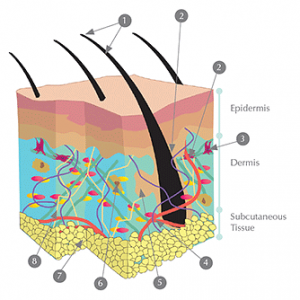 • The blood supply to your skin can become less efficient, resulting in your skin appearing less vibrant. As you age your skin’s natural protection begins to decline, leaving it vulnerable to lasting damage. It produces less and less collagen, elastin and hyaluronic acid, which causes the skin’s elasticity, firmness and smoothness to be reduced. This eventually results in fine lines and wrinkles forming. Skin cells aren’t renewed as regularly and your blood supply can also become less efficient, meaning your skin can begin to look less vibrant and fresh. Your skin’s epidermis also doesn’t retain as much moisture, making it less firm, plump and elastic, which negatively impacts your skin’s tone and texture. This can result in fine lines and wrinkles developing as well as your skin tone becoming sallow and dull. Your skin’s natural antioxidants can also become less prevalent and less effective leaving your skin vulnerable to damage. Which means that exposure to harmful UV rays in sunlight, also known as photo-damage, as well as unhealthy activities such as smoking, only accelerate your skin’s natural decline.